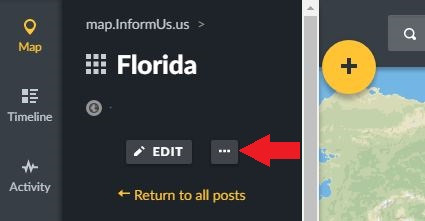 Why does InformUs.us use Ushahidi? How does InformUs support anonymity? What is the easiest way to submit and map an occurrence? Why sign-up/register as a user with InformUs? How do I save or clear a keyword search; get email notifications when posts are published with my keywords? See NYT article for how Ushahidi -- Swahili for Bearing Witness -- was developed and first used as a crowd sourcing platform, comparable yet different from Wikipedia, to help identify and respond to those suffering humanitarian crises. We also picked the platform because it is open-source, scalable, and allows public and professionals to visually represent and communicate different types of occurrences, while contributing to a searchable database notifying journalists and other key team members automatically, while maintaining anonymity, if needed. The system also allows for easy export of the full dataset, or sub-sets of contributed data, for future research and all to use. We maintain SSL certificates, assuring full encryption of your transmitted data at our secure sites. Occurrenes reported using our forms are then reviewed by the editorial staff before publication. Reporters are not required to sign up or create an account, or provide any personally identifiable information. If there is any fear of possible loss of anonymity, or specific need to assure anonymity (fear or reprisal), reporters can opt to use additional safeguards such as Tor browsers; or, instead, consider reaching out by phone to other organizations where your reporting can go unpublished, such the American Library Association Office of Intellectual Freedom, and their State Library Association Intellectual Freedom Committees, who can record incidents in a non-published database. 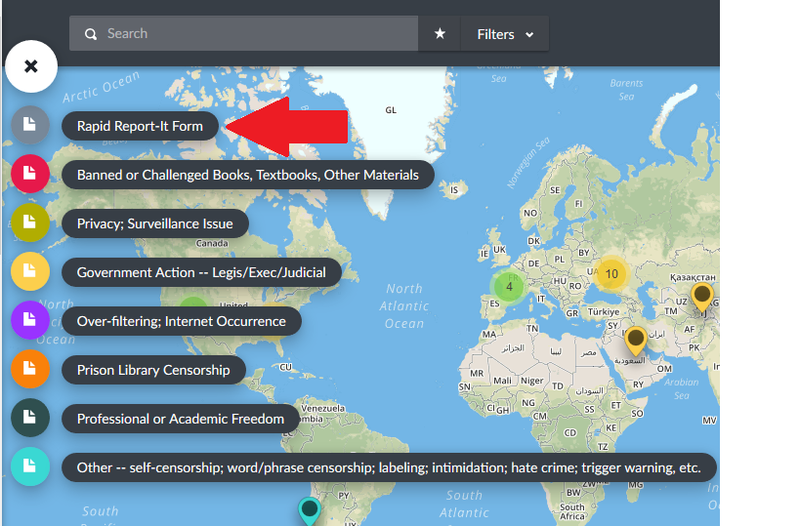 We offer various reporting forms, which we hope you will use to help graphically represent the depth and breadth of different censorship forces. If you are new to our site consider using the General Form, based on the American Library Association form (As indicated by red arrow in second screenshot). This Form will allow us to gather the pertient information about the occurrence, and for our editors to later map and publish according to type of occurrence. Using the General Form also will allow us to easily share your information with the American Library Association, through regular bulk exports of data. However, if you need immediate help with your occurrence, please also contact the ALA and your State Intellectual Freedom Committee directly, as well as reporting at InformUs for the entire world to see. Signing up provides many benefits, listed below, but still guarantees we will not reveal any personally identifiable information. Your anonymity can be reinforced by picking a non-personally identifiable user name or avatar. (NOTE: your user name/avatar will be visible alongside your report if you are a registered user and have signed in). When you register as a user, you benefit from: 1) Being able to submit and come back to edit your submissions as you discern more information about your occurrence; 2) You can set up automatic email notifications for when occurrences happen within a certain distance of your geographic location; 3) You can choose to contact us to become an editor (you can be listed on a site web page or remain anonymous); 4) you can build your own collections of censorship data. 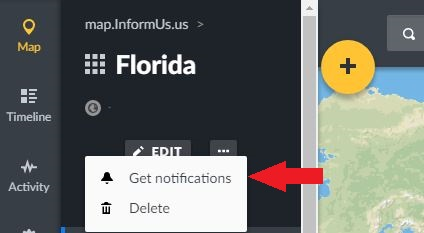 To register, click on the "Sign-Up" icon on the lower left side-bar at the Report & Map Occurrences http://map.informus.us. Then simply choose your display name (will appear next to your report), provide your email and choose your InformUs password. How do I save or clear a keyword search; get email notifications when posts are published with my keyword(s)? The following screenshot shows where to cancel or save the search (SEE LOWER LEFT AREA of screenshot. Social and research networking sites will be developed for InformUs.us.